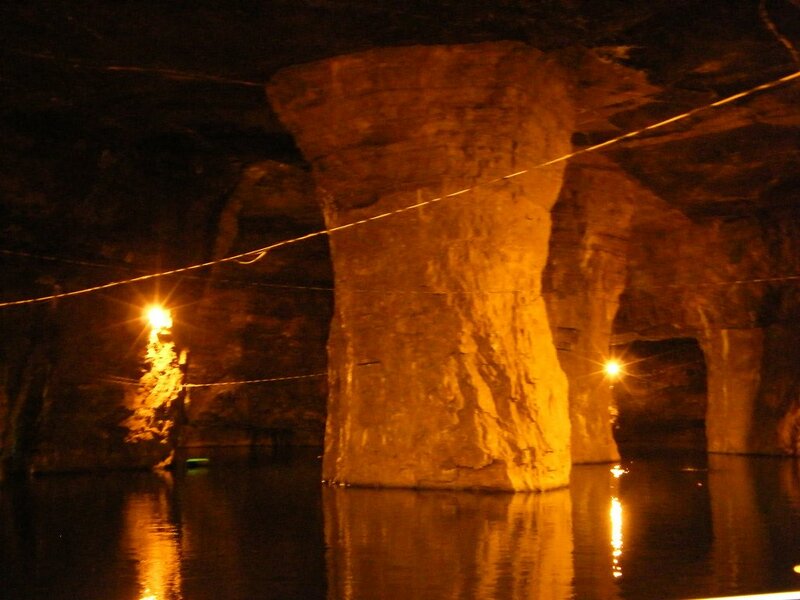 Beneath the historic, sleepy town of Bonne Terre, Missouri, lies a billion-gallon, 17-mile long lake inside a mine that dates to the mid-1800s. It's eerie, dark and an altogether unique experience for adventurous divers. Both the depot and Bonne Terre Mine are listed in the National Register of Historic Places. Fortunately for the owners of the flooded mine, the miners used mules to help haul ore and equipment in and out. Divers and those on dry walking tours must descend 1/4 mile and down the 65 steps into the heart of the mine and to the docks. The trail and caverns were all carved using hand tools. Run by [West End Diving](http://www.westenddiving.com/), the water and air temperatures don't vary much, regardless of what's happening up top. The air temp is a constant 62 degrees F and the water is generally a chilly 58 degrees F. There’s no thermocline to worry about. Some of the underwater scenes in the movie _The Abyss_ were filmed in these waters, so the mine has had its own bit of stardom. The chilly water in the mine fills 88 miles of passages while the surface has 17 miles of navigable shoreline, so there’s plenty of room to film your own movie. Visibility is easily around 100 feet (30 m) with very little silt on the bottom to muck it up. While the deepest parts are over recreational limits, most dives are done between 40 and 60 feet (12 to 18 m). Once they stopped the work in the mine, the water pumps were turned off and the massive caverns were allowed to fill. Remnants of the mine's past can still be seen littered around. Divers can see ladders, scaffolding, carts and even tools while diving. There are limitless opportunities for silhouette shots. So while the rule against hand-held lights, camera flashes, and strobes may at first seem daunting to a photographer, it's still easy to find your shots using what light is available. The mine is dark and deep in many places, despite the 500,000 watts of surface lighting in the mine. Two guides, one in front and one trailing, carry multiple lights to make sure you don't miss a thing. Sometimes they even use them to give you some interesting perspectives. The diving done here is quite similar to night or even dusk diving elsewhere, minus carrying your own light. But don't stress about not having one; in addition to the guides, a kayak also follows on the surface for divers who run low on air and need to end their dives early. If you like tunnels and swim-throughs, interesting lighting arrangements, crystal-clear water, zero current and just relaxing while swimming under a town, then you should head to Bonne Terre. There's a large deck at the water's edge with a hang bar right below at 15 feet (5 m) for safety stops. A submerged platform floats up and down depending on how much weight is on it to allow for easy exits. Techies, don't feel left out. While most of the 28 trails are well within recreational limits, the owners are in the process of developing three more specifically for technical diving. The post Diving Under a Town – Bonne Terre Mine appeared first on Scuba Diver Life. This entry was posted on Thursday, July 16th, 2015 at 5:30 pm	and is filed under Rebreathers, Scuba_News, standards, Teach First Aid/CPR, Tec, Tec Diving, Technology, TecRec, TecRec IT Crossover, UW Photography, Wrecks. You can follow any responses to this entry through the RSS 2.0 feed. Both comments and pings are currently closed.